Ivory Coast coach Sabri Lamouchi has selected a vastly experienced 28-man provisional World Cup squad. Striker Didier Drogba, capped 99 times, spearheads the so-called 'golden generation' who will have a last chance to grab glory in Brazil. Brothers Yaya and Kolo Toure are joined by fellow Premier League-based stars Cheick Tiote and Wilfried Bony. Giant forward Lacina Traore has been included despite suffering an injury-ravaged loan spell at Everton. The 6ft 8in striker made only two appearances for the club; scoring on his debut on 16 February but then kept out with a leg problem until the final day of the campaign when he came off the bench in the 90th minute. Lamouchi will have until 2 June to decide whether to gamble on Traore and include him in the final 23-man cut. The Elephants will face Colombia, Greece and Japan in Group C, which appears to be a much easier draw than in their two previous appearances at the tournament. Unlucky 2006 and 2010 group draws resulted in the West Africans finishing third behind Argentina and the Netherlands in Germany and third behind Brazil and Portugal in South Africa. 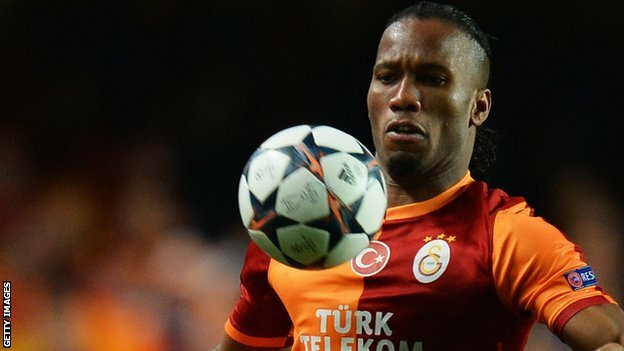 Former Chelsea star Drogba, 36, is confident his side will do better this time. "Competing at the previous two tournaments was very difficult," said the Galatasaray player. "We have a realistic chance to do better in Brazil and get past the first round." Goalkeepers: Boubacar Barry (Lokeren), Sylvain Gbohouo (Sewe Sport), Ali Sangare Badra (Asec Mimosas), Sayouba Sande (Stabaek). Ousmane Viera Diarrassouba (Caykur Rizespor), Constant Djakpa (Frankfurt), Brice Dja Djedje (Marseille), Jean-Daniel Akpa-Akpro (Toulouse). Forwards: Gervinho (Roma), Didier Drogba (Galatasaray), Salomon Kalou (Lille), Wilfried Bony (Swansea), Seydou Doumbia (CSKA Moscow), Lacina Traore (Everton), Giovanni Sio (Basel).